Mostly clear early followed by mostly cloudy skies overnight. Low near 50F. Winds S at 5 to 10 mph..
Mostly clear early followed by mostly cloudy skies overnight. Low near 50F. Winds S at 5 to 10 mph. 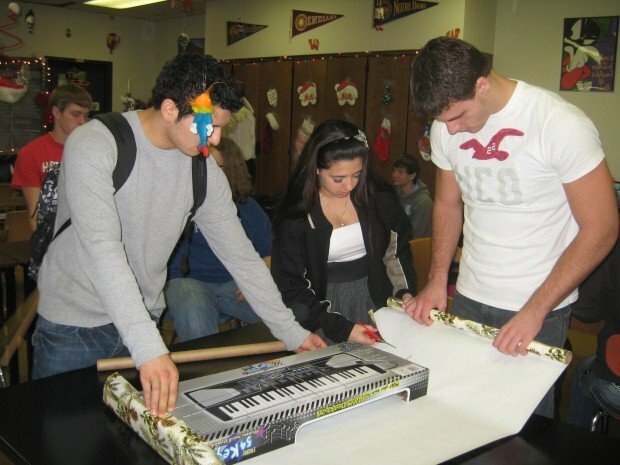 Portage High School students, from left, Jorge Espino, Raquel Galvan and Thomas Rasch wrap Christmas presents for children in need as part of a monthlong community service project. Tanika Fink carefully wraps a Christmas present for one of 34 children in need. Fink's class raised money and purchased gifts for the children as part of a December service project. Students in Rob Kania and Nick Haas' classes wrap presents for children. Portage High School students raised more than $3,700 to provide Christmas gifts for 34 children in need. PORTAGE | Students at Portage High School are learning a lesson this month that can't be taught from a textbook — that they can make a difference. The 2,700 students at the school, their teachers and staff are participating in the first month of a giving project at the school. It is part of Portage Township Schools' effort to use developmental assets in the schools. Developmental assets are 40 characteristics that research indicates people need to be successful, high school English teacher Jodi Barney said. Each month Portage High School adopts an asset. For December, the asset is service to others. Each second-period class was given the assignment of creating and implementing a community service project. Barney said the projects empower students to know they can make a difference in other people's lives. Students have embraced the idea. They embarked on projects ranging from adopting families for Christmas to singing at nursing homes to raising money for various charities and making sure local food pantry shelves are stocked. Teachers Rob Kania and Nick Haas combine their classes. Their students decided to raise money and purchase Christmas gifts for children from area Angel Trees. Students raised more than $3,700 and will provide Christmas gifts for 34 children. "Imagine if you were in their boat, if someone couldn't afford to get anything for their child at Christmas," said junior Joanne Buford on why she and her classmates adopted the project. Junior Emily Brinkley said students wanted to ensure the kids get some Christmas joy. "We want to make that experience for them," Brinkley said. "We don't want them to think 'Santa forgot me.' "
Kania spoke proudly of his students' accomplishments. "It just blows me out of the water completely," Kania said. "Nothing I teach them in chemistry teaches them the same thing they've learned from this project. They get it. They get the point and the point is, it is not about them, it is about other people." Marcia Hobart's class is collecting for Castaway Critters, a nonprofit animal group. Her students also will be singing at a local nursing home. Senior Ali Robinson suggested the caroling, she said, because her grandfather had lived in a nursing home. Robinson wanted her classmates to bring some joy to those who might be forgotten this time of year and, she said, the project shows it doesn't take a lot of money to give to others. "As much criticism as this generation receives, they are willing to step out of their comfort zone," Hobart said. "It is refreshing."